This week’s Coast Diamond featured retailer is Radiance Fine Jewelry of Chicago, Illinois. Radiance Fine Jewelry of Chicago is independently owned by Rebecca Dohe. Radiance has served the Bucktown community of Chicago for over seven years, and in that short time has become the most referred jeweler in the area. Rebecca believes that “trust and technique are paramount when it comes to selecting, creating, or restoring the perfect piece of jewelry.” Radiance has been chosen by peers in the industry as a Master IJO Jeweler, awarded only to those independently-owned jewelry boutiques who show exacting standards at the forefront of the industry. Radiance Fine Jewelry’s owner and in-house jewelry designer, Rebecca Dohe, working in the full service repair shop. Our Coast Diamond engagement rings are a perfect fit for the selection of high quality diamonds and gemstones that the award-winning Radiance Fine Jewelry offers. In our halo diamond engagement rings, the center stone is encircled by smaller diamonds that increase the appearance of the size of a stunning center stone. Radiance Fine Jewelry: Coast Diamond cushion-shaped halo engagement ring (LC5381) with rose gold shank. Radiance Fine Jewelry: Coast Diamond cushion-shaped halo engagement ring (LC5356) with diamond shank and wire trim. Our classic Coast Diamond engagement ring has intricate and subtle design details like milgrain edging. Radiance Fine Jewelry: Coast Diamond art deco design engagement ring (LC5471) with matching wedding band (WC5471). “Engagement ring shopping has never been more dazzling! ” Try these and other Coast Diamond engagement rings at Radiance Fine Jewelry in Chicago, Illinois. Congratulations Radiance Fine Jewelry of Chicago for being Coast Diamond’s Featured Retailer of the Week! Jay Feder Jewelers of Denver, Colorado is Coast Diamond’s Featured Retailer of the Week! Jay and Celia Feder’s love story began when Celia moved from her hometown of Los Angeles, California to attend high school in Denver, Colorado. She worked for the Feder family as a mother’s helper and “the rest, as they say, is history”. Jay and Celia lived in Los Angeles with their young family until 1978. Jay had begun his work in the diamond industry in LA as a wholesale diamond broker for a Belgium company. Being a 5th generation Denver native, Jay missed home, so he and Celia moved back with their daughter, Rachel Leah and son, Yisroel (Marc). Soon after their return in 1979, Jay Feder Jewelers began. With a unique passion for teaching, Celia and Jay valued the opportunity to educate and tailor their clients’ experience completely around the individual needs of the customer. This approach to customer service became their hallmark and their Denver business grew. The success of this philosophy also compelled Jay to write The Practical Guide to Buying Diamonds. A moment only created by Jay Feder Jewelers. Today, Jay Feder Jewelers is under the eye of Celia and Jay’s son, Marc who spent 10 years beside his dad before starting the New York branch in 2012, and eventually taking over the family business. Marc is dedicated to honesty and truth with every customer and business transaction. Jay Feder Jewelers now enjoys a greater reach in the diamond industry with stores in Denver and New York. Stop into Jay Feder Jewelers in Downtown Denver to find these Coast Diamond stunners and get educated by the ones whose passion for beautiful diamonds is next to none. Jay Feder: Coast Diamond modern engagement ring (LC5340) with diamond encrusted split shank, customized with a rose gold halo. Jay Feder: Coast Diamond rose gold halo engagement ring (LC5340-RG) with diamond split shank. Jay Feder: Coast Diamond 1CT halo engagement ring (LC5357) featuring pave diamonds and milgrain edging. Shown with matching wedding band (WC5357). Jay Feder: Coast Diamond engagement ring (LC5389) with pave diamond shoulders and milgrain edging. Shown with matching wedding band (WC5389). Congratulations to Jay Feder Jewelers of Denver, Colorado for being Coast Diamond’s Featured Retailer of the Week. 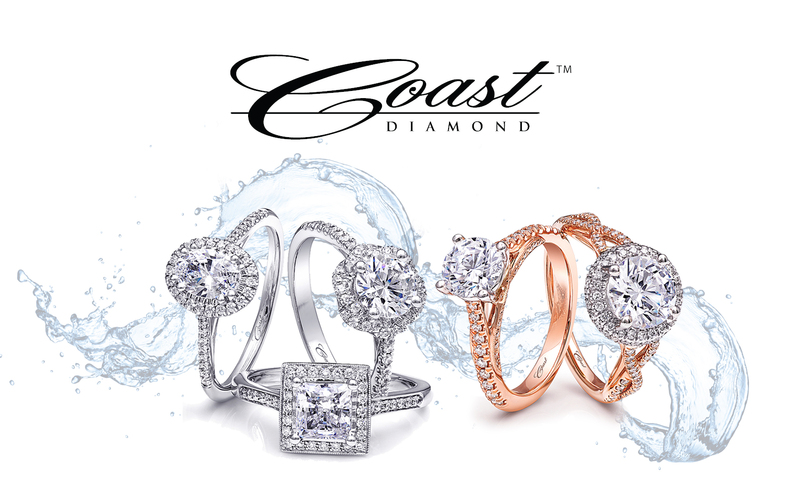 Diamond Cutters of Western New York is Coast Diamond’s Featured Retailer of the Week! GIA grading report of a diamond cut at Diamond Cutters. “A diamond’s value is determined using all of the 4Cs.” Cut determines value because the better the cut the more beautiful the diamond. From colorless the fancy colors like pink, blue or yellow, diamonds are graded on a color scale determined by the Gemological Institute of America (GIA). The clarity of a diamond determines value by the measurement and location of flaws in a diamond. Finally, carat is often confused to be the size of a diamond, but the carat of the diamond is actually based on the weight of the diamond. A Coast Diamond designer setting deserves a perfectly cut diamond like those cut at Diamond Cutters of Western New York. Visit Diamond Cutters and find the perfect engagement ring for your spring proposal, like this classic Coast Diamond cushion-shaped halo. Diamond Cutters: Coast Diamond radiant cushion-shaped engagement ring (LC5257) with diamond shoulders. Jenna Dewan Tatum wears her twisted diamond shank engagement ring, like our 1CT ring below, with a double stack of wedding bands. Diamond Cutters: Coast Diamond 1CT round center stone engagement ring (LC10291) with a twisted diamond shank. Diamond Cutters: Coast Diamond 1.5CT engagement ring (LS10170). The stunning side-view of Coast Diamond’s 1.5CT engagement ring. Diamond Cutters: Side-view of the Coast Diamond 1.5CT engagement ring (LS10170) with a petite diamond gallery. Congratulations Diamond Cutters of Western New York in Cheektowaga, NY for being our Coast Diamond Featured Retailer of the Week! Coast Diamond is pleased to announce this week’s Featured Retailer is Douglas Jewelers of College Station, Texas. Douglas Jewelers began with John Douglas in 1964. When the Douglas family decided to retire from the jewelry business, Greg Gordon saw a fantastic opportunity to serve the community he loves by gaining ownership of Douglas Jewelers. With Gordon’s experience in the jewelry business spanning 16 years and 7,000 family-owned jewelry stores, he and his wife, Lisa were thrilled to be able to continue the tradition of Douglas Jewelers. The Gordon’s are proud to carry on the tradition of loyalty and customer service started by the Douglas family. They “work diligently, so every customer’s jewelry decision is as enjoyable and stress-free as possible.” The strong history behind Douglas Jewelers gives an “essence of ease” in bringing that service to their customer. When you stop into Douglas Jewelers to shop for an engagement ring for your spring engagement, we know you will love this Coast Diamond halo engagement ring. It is our most popular halo engagement ring and was the ring that “She said Yes!” to on The Steve Harvey Show just last month. Douglas Jewelers: Coast Diamond classic halo engagement ring (LC5257-0.05) as seen on The Steve Harvey Show. Douglas Jewelers: Coast Diamond Charisma Collection engagement ring (LC5399A) with floral petal accents around the center diamond and matching wedding band (WC5399A). Douglas Jewelers: Coast Diamond double halo engagement ring (LC10130) with split shank leading up to a 1.25CT center diamond. Congratulations to Douglas Jewelers of College Station, Texas for being selected Coast Diamond’s Featured Retailer of the Week!